Everlasting may be an exaggeration, but these blooms will last through a couple winters. 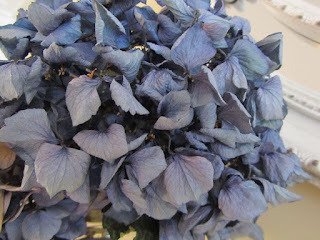 Do you know what's an amazing thing about hydrangea blooms? When you cut them to bring indoors for a vase, you don't have to do much of anything to produce lovely dried blooms. You simply fill a vase with water, trim the stems of your blooms, remove excess foliage, place the stems in water, and allow them to dry, as the water evaporates. I've done this the past couple of summers. It always amazes me, because so many other flowers don't look so great after a few weeks in a vase of water. But hydrangeas do dry so nicely, and so easily. They fade some, as they dry, and then a bit more after drying. I think they're beautiful. Delicate, china blue petals. A remembrance of summer, when the winter light is dim and icy. So lovely! Flowers can really add a bright spot to your day. I think so, too! Especially in a place where it feels like flowers go away for a long time. My hydrangeas are more of a pale green and fade to a tan color--but I love how they look--so textural. Yours are beautiful. I love those green hydrangeas. I think they look beautiful in an all green and white bouquet! Blue hydrangeas are my absolute favorite. 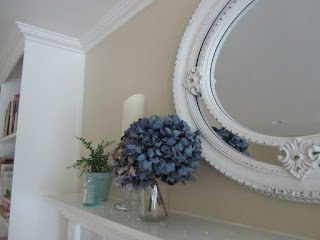 I have a brilliant blue hydrangea bush that I also have cut and dried flowers from. The dried blooms are so pretty, and a way to keep enjoying the flowers throughout the year. They are so pretty, aren't they? The petals are so delicate looking, almost like tissue paper. I've never dried them with water in a vase. I just let them dry on the plant. Come to think of it, that's probably the same thing. I think you're probably right, in that drying them on the stalk outdoors is basically the same. They may hold more color cutting them for indoors, so the sunlight doesn't fade them. But I find it interesting that hydrangeas can just dry while in a vase, and look good, but something like roses or daisies need different treatment to dry them.